Whether you are looking to purchase your very first bodhran or planning to upgrade to a better quality one, this section is here to help. This decision is made even more difficult by the fact that there are so many superb makers out there now (See the list below). My husband, Mark, and I are simply too busy with other projects to keep making our Cape Breton Bodhrans, but I can tell you from first hand experience that making an instrument is done out of passion and not for love of the almighty dollar. A great deal of time, effort and care goes into making a bodhran so please keep that in mind when looking to buy one. I would always suggest you deal directly with a maker, or one of their reps in your country, as most shops that sell instruments get them in at cost price, making more than the actual maker. With the exception of a few really great shops, most music store employees usually don’t know that much about bodhrans. The dead give away is when they have them hanging in the front window, baking in the direct sunlight. In fact, you probably already know more about bodhrans than they do. The more time you spend researching the best maker and drum for you the better you will feel about your final decision. Don’t be afraid to email makers to ask some questions, but remember to sift through their websites first as many of your questions are most likely already answered there. If you are just looking for something to get you started and don’t want to pay alot of money I’m sure you already know you will simply get what you pay for. There’s nothing wrong with starting out on an inexpensive drum and then upgrading once you’ve decided to stay with it. My very first drum was a very cheap one made in Pakistan and it served me well in my early stages. Once you try a great drum though you will instantly hear how much better you actually sound. I hesitate to recommend one maker over another as the choice is such an individual one. I’m sure many people would just like for me to say ‘This is the one drum I recommend’ and make the decision for them, but going by only one person’s opinion wouldn’t really be in their best interest. I also don’t think any one person should have that much power. Collecting information from lots of different sources is the best way to find the drum just for you. I know that people like helping people so please leave a comment to exchange information about bodhrans, where you got yours, what size is it, etc. and your overall experiences in the comments section below. 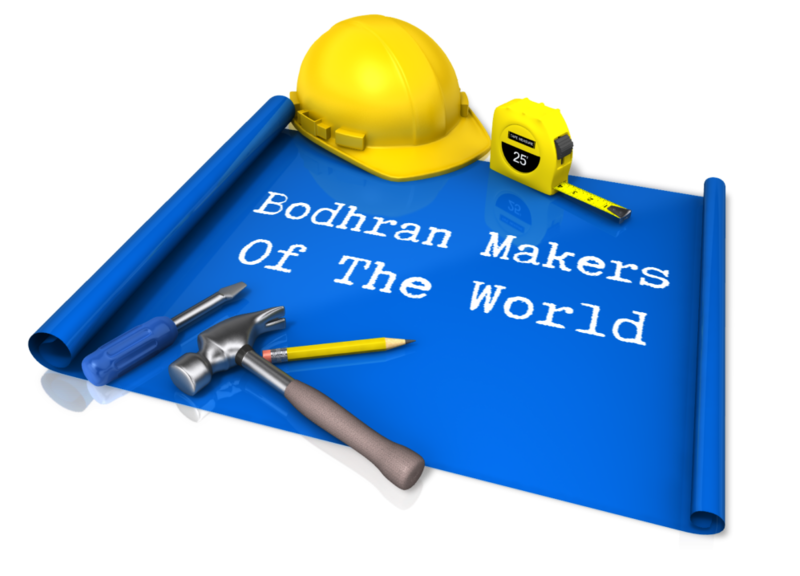 This will help everyone become more educated about bodhrans and makers around the world. I ordered my bodhran several years ago from Malachy Kearns. The sound is nice, the quality of the goat skin is perfect. However, the workmanship of the frame didn’t convince me. Many of the nails were crooked and the band was warped quite a bit. Would you consider this a good bodhran for the price? I got mine in 2005 during my summer holiday in Ireland. I had a journey directly to Malachy Kearn’s shop, after I had seen his bordhrans on his website. There is an option so you can choose or design yourself any picture you like and get it painted on your bodhran to customise it and make it unique (I took that option and have a wonderfull “girly” bodhran with a circle of green and golden shamrocks all around it). Don’t remember the price but I think it was between 80 and 120 Euros… I chose an 18′ cause I prefer deep low sounds, and tried many bodhrans before I found THE ONE. They did a great job on the custoizing, sellers in the shop really help for the choice, you can see them manufacture the bodhrans through a huge window between the shop and the manufacture. The bodhran comes with a standard tipper (I bought another one I thought would be better), a notice explaining how to take care of the drum, and a little amount of grease. I LOVE your videos. I am just starting, but they have been soooooo helpful. I know you are overwhelmed/busy, but I have a unique problem. I picked up a bodhran on my recent trip to Ireland (Dingle). Returning to high and very dry Colorado, I find the drum is always extremely tight. I have to add water every few minutes to keep it flexible. Would it be smarter to to take the impure route and purchase a REMO (artificial head, tunable) drum, or try to work with a maker to have one with a goatskin head that works for an extremely low (2+% humidity) environment? Would one? Thank you so much, and I understand if you are too busy to reply. I would first recommend sanding down your drum skin with sandpaper ~ 240 grit, then 400, up to 1000 – 2000 grit. You won’t believe what a difference this will make. If the skin is rough it will make it feel like a baby’s bottom. Then I would treat it with a skin conditioning treatment. Here’s a quick video I made on how to do that. http://www.youtube.com/watch?v=HJrdBFDSIng I hope that helps. Please let me know how you get on. About 6 years ago, I purchased a 16″ Belgarth tuneable in a beautiful shade of soft teal blue. Eoin Leonard was wonderful to work with–he answered questions before I made the purchase, and the tipper that came with the drum was exactly what I’d told him I wanted. The goat skin is good quality, and the drum’s tone is lovely. I checked the Belgarth website this morning, and currently the price of the 16″ in color is 115 Pounds, with 50 extra for the tuneable version–not cheap, but (in my opinion) well worth it. I have been very happy with my Belgarth bodhran, and it even received the Kevin Conneff seal of approval when I played with the Chieftains–he asked to try it, took it out for a brief spin (so to speak), and pronounced it a good one. Can’t argue with that! I purchased a 16″ drum for just under $200 about a year ago from a lady that makes and sells them at a local Ren Fest. I’m in love with it (although that one day I’ll probably outgrown it and want a better one). What was nice was that I got to try it out before I bought it. And having taken Michelle’s advice about sanding the the skin… it’s better than ever!! It really really made a huge difference in the sound!! I also treat the skin now and then with shea butter. Since I only own two drums, obviously I can’t say with any authority that one maker is better than another. But I can share that I did have a very positive experience in purchasing my second drum. My first drum, a birthday present, was a Pakistani drum that I took time to improve by sanding the skin, taping the rim, and removing the cross-braces. After about seven months of learning on that drum (with the help of Michelle’s excellent tutorials), I decided I wanted to upgrade to a tunable drum. It seemed that most of the custom drum makers’ prices started in the three-hundred-and-something range, which was beyond my budget. After looking around quite a bit on-line, I settled on a Hedwitschak Lite Line 2.0 Classic, a mid-range priced drum that I purchased from whistleanddrum.com. Again, having never played anything else, I can’t really compare my Heddy to any other drums, only to my old Pakistani drum, but I am very pleased with the new drum, which I have been playing about six months now. Whistle & Drum were great to work with, so I can heartily recommend both the drum and the dealer. BTW, for anyone looking at the Lite Line drums, in addition to the Classic model, there are also Deep and Compact models — trust me, for anyone who started on an 18″ drum, as I did, the Classic model will seem very compact in comparison. Though I don’t know the quality of his Bodhrans (they look nice, though) I purchased a bunch of very fine tippers and rods from there. Hi, I bought my bodhran by mail order from Paul McAuley a couple of years ago. My model is a 12 incher with a depth of 5″ in black. I can heartily recommend the construction quality and tone of these bodhrans, though most players would probably find a larger diameter more comfortable. You also get a nice wooden handled tuning key and a brilliant little “kebab stick” tipper. These are mellow sounding instruments and I would say suit nicely “top-end” style playing. Thanks for the link Michael. I will gladly add Ralf to the Bodhran Maker List. Hi Michelle. Thanks for the info! Love the tips you send along. I’ve recently become a vegetarian and have started eliminating animal products from my life. Getting rid of my leather purses and shoes was easy enough, but then I walked into my office and saw my two genuine goat skin bodhrans…..my heart sank. I haven’t gotten rid of them yet, but I haven’t been able to bring myself to use them. My question to you is: do you know of any half decent quality animal-free bodhrans on the market? I realize this is probably taking away the essence of a bodhran, but I my playing is really just a hobby that I enjoy, nothing professional. I don’t want to give up playing. (I have a clipboard practice bodhran, but I’m looking for an actual drum). As always, thanks for your time and efforts. Cheers! On another note. I’m going to be travelling to Cape Breton this summer for the first time. Can you recommend a good bodhran shop there? I have a ‘basic’ one, like your pakistani one but I want to move into the ‘high end’ and get one like yours. Sheldon, that’s fantastic to hear! Thank you so much for taking the time to share this. It’s not only rewarding for me as a teacher to know I’m making a difference, but it’s also very inspiring to others who would like to get good enough to start playing publicly too. On the bodhran upgrade note, most shops will not have higher end models as they buy cheap and mark up high, but I would definitely recommend tunable. My drum is 15 1/2″ diameter and 5.5″ deep and is one of our own Cape Breton Bodhrans, but we just haven’t had any time to be making drums lately. We used to sell to MusicStop when we still lived in Canada, but to be honest the shops make more than the makers that way. I would recommend buying a better drum directly from a maker. Even if you can’t try before you buy most makers will gladly answer questions you may have and as a result you feel more confident about your decision. Also, have you tried the Ottawa Folklore Centre? I haven’t been in the Halifax Folklore Centre for years, but they used to carry bodhrans. The Gaelic College often have drums in the Gift Shop too. If you’re around the Gaelic College between July 25 and August 12th (Mon-Fri) be sure to stop in and say hi. I’ll be teaching there and always glad to meet online students in person. I can recommend Michael Vignoles’ bodhrans. http://www.michaelvignoles.com listed above. I have his 16″ x 4-1/2″ notch tunable and it is great. You don’t need a wrench, he incorporates finger-wrenches in the design. And a nice design it is, too. I am a piper but have always had the desire to play the bodhran. I have been playing with your “skewers” as I do not own bodhran or tipper. I have your 7 in 7 down pretty well. Just looking for advise on my first purchase. What type of wood do you recommend bodhran be made out of? I want inside tunable, 16″ X 5.5. Any advice would be appreciated . I’m looking for a bodhran maker in Italy, Swiss or France that would be interested in a Makers festival next July in the Alps. As a player, I started on a no-name bodhran made in Pakistan… no comment, but it was OK for a start. Then I bought the biggest double-skin Brendan White available. Great drum, big sound, subtle manners also available. But. It was a bit heavy for me! On stage it was taking me 30sec to put it down safely and then switch to another instrument. does anyone know of a maker in Newfoundland? Has anyone had experience with the more recent bodrhans which Remo puts out with the bahia bass synthetic head? I live in Southern Nevada USA where summers are very hot and dry (105 to 115+) and have been told by some local drummers that would be best given the climate. I own three drums. the first is an 18″ x 3″ locally made drum ( Northern California ) cost about $250 US. The second is a 14″ x 4″ by Meinl which has a very nice sound for a small drum. Good for beginners. Cost about $150 US. My third is a high end 15″ x 6″ ,costum made drum, made by Diarmaid O’Kane ( Shamus O’Kanes son). By far the best drum I have ever played. The cost is about $400 US. We spoke by e- mail and he really got to know me before starting to make the drum. Not only is it beautiful but the sound is amazing. As Michelle says you get what you pay for. I have been playing for over two years and before I picked up the bodhran I played trap set in a rock band from the sixties. Michelle’s videos have been very helpful and the best advice I can give is to play, play, play. Ordered my first one from Malachy Kearns July 3rd and hope it arrives this week. I purchased the 16″ since I am a beginner, although I played drums in various bands in my life. Taught myself to play beginning at age 12, so, that might be the way I learn to play the Bodrhan. If I get good, then I might go with an 18″ later. Hopefully, I will not drive the neighbors away since I live in an apartment. Also, I downloaded a metronome app for my iPad 2 for practice. I think I will make several trips to the countryside where the cows will be my critics and I can play a bit louder. Malachy Kearns bodhrans are not made for the love anymore, they are made for tourism and anyone who gets a picture painted on their skin is a tourist. For anyone who is looking to buy a pro bodhran id recommend Seamus o Kane, i have one and i know many people with one and the sound production is by far the best. I would also highly recommend his son Diarmaid who also makes bodhrans. I prefer Seamus’ bodhrans personally because he has a bit more experience and wisdom in bodhran making and Diarmaid is taking slightly towards the fancy route but their bodhrans are by far the best sounding and also very reasonable. I just wanted to report on my experiences buying a Belgarth bodhran. I have played a few prior to ordering one and settled on a 14″ witha deep 6″ frame. The process has been painless and Eoin Leonard kept me informed every step of the way. the only delya was when he contacted me to say that the origianal skin he had applied to the drum was not producing the right kind of sound for a Belgarth bodhran so a replacement was used. The result is a lovely drop with great tone and response from the skin. I bought my bodhran whilst on a visit to Totnes in back in the summer . It was purchased from a shop in fore street, that sells all sorts of Celtic instruments and is well worth a visit. Any way the shop keeper gave me a few tips on playing and how to change the pitch. I am having fun learning how to play it and have been recording with it. The results should be available for you to hear on my website in the new year. I am a guitarist/bass player and I would love to try something new since I got some time on my hands. The bodhran caught my attention and I fell inlove with it now. I’m looking to get one now and your advices were very helpfull. Only thing I was wondering about: what is the diffence between the sizes? Is it the length of your arm or just a deeper sound for a bigger diameter? Also any suggestions for a beginner with not a very big budget? Thanks in advance! Hi all! I´m from argentina and my parents are travelling to dublin. can you recomend any bodhran barand or maker to buy there? thamks! I recently upgraded from an entry level walton to a drum hand made on Vancouver Island, Canada. I live in Vancouver and was pleased to find this guy that sources all his materials locally from the farms and forests in the area. It has cam tuners so you don’t even need a tool to tune it. It sounds awesome and I’ve heard so many positive comments on how my drumming has improved. Does any one know if it is possible to obtain a Paul Loughlin bodhran. Is he still making these? short vids to be very helpful,thank you. My recommendation is to always try out a bodhran before you buy it. The best place to do this is at a Celtic/Irish festival. Often there will be a Bodhran workshop offered for free and the instructor will have brought several of his own Bodhrans for you to use during the workshop. Once you get your hands on a good drum you will be hooked and won’t want to give the Bodhran back at the end of the workshop. Another way is to get into a Celtic session and after a few sessions ask any Bodhran player there to let you try their drum. Surprisingly most Bodhran players are more than willing to let you play their ‘pride and joy’. I have had 3 tunable Bodhrans. 2 from Albert Alfonso (bought at 2 of his Irish Fest workshops) and the latest from Christian Hedwitschak (after trying out one of his drums at a 7-day Bodhran workshop in North Carolina). To be able to afford the new drum I had to sell my first ‘baby’ (my wife’s stipulation….. “I’m not having 3 #*?! Bodhrans in the house”). Parting with my first drum was like sending my first-born to college. You knew it was going to a reputable institution but you were uncertain as to what trouble it might get into without your hands-on supervision. Don’t forget that every good Bodhran need a good tipper. In fact several good tippers will be needed to get a variety of sounds out of the drum. I have 4 tippers that I tend to stick to (2 by Steve Moses and 2 by Albert Alfonso). My advice… get away from the big, spherical-ended ‘goat bashers’ as soon as you can. No one at a session wants to be drowned out by the loud Bodhran player. Please note that these are my own recommendations and comments. Many other players may disagree with them. That’s why there are so many Bodhrans and tippers out there for you to choose from. Next post: Every Bodhran Player Will Want One!